Looking for a UV sterilizer for your Reef or Freshwater tank? This guide aims to make that decision easy for you. You’ll be walked through the process of what they do and how to choose the best UV sterilizer for your set up. What do UV Sterilizer do, and How to They Work? What do UV Sterilizers do, and how do They Work? 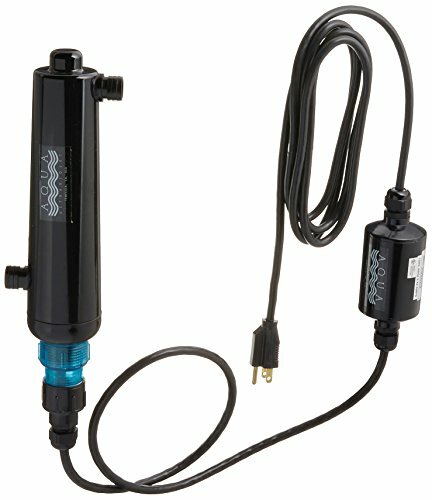 UV sterilizers are small electronic devices that sit inside your aquarium. They contain a bulb that emits ultraviolet (UV) light, which works effectively to kill bacteria and pathogens inside your aquarium without harming your fish or corals. UV light is able to accomplish this because it scrambles the DNA of bacteria, either killing them outright or sterilizing them so that they are unable to reproduce. Since most bacteria in an aquarium have a lifespan of only a few hours, the loss of reproduction is enough to effectively end any algal or pathogen outbreaks. Unlike chemical treatments, UV light does not affect your fish or corals. The reason is that bacteria are single cellular organisms with just a thin membrane separating their genetic contents from the outside world. UV light is able to easily penetrate this thin membrane, but cannot penetrate through the relatively thick skin of fish or the hard structure of corals to cause significant damage. It’s important to note that this same rapid attenuation of UV light when it encounters a solid obstacle means that UV light is best for reducing the chances of a pathogen outbreak rather than 100% eliminating it. Any bacterial cells that are hidden in the gravel at the bottom of your aquarium or are behind other structures will not be hit with the UV light and will survive. In addition, because UV light is not fully lethal, it can allow some bacteria to continue to survive and reproduce. That said, UV light is an extremely effective, low-maintenance solution for reducing the chances of disease outbreak from bacteria in your freshwater and reef aquarium tanks. Unfortunately, UV sterilizers don’t discriminate between disease-causing and beneficial bacteria in your aquarium tank. For this reason, it’s important to avoid running the UV sterilizer when you first cycle the tank. This allows beneficial bacteria time to attach to the gravel at the bottom of your tank or to fish or corals, where they will be relatively protected from the damaging UV rays. There are a large number of features that go into UV sterilizers, which can make choosing the right one for your tank a tough choice. In this section, we’ll cover the main differences between UV sterilizers and explain what features may be better for specific aquariums. Not all UV sterilizers have the same power to kill bacteria and viruses. 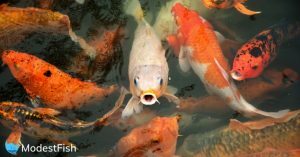 Cheap UV sterilizers are known as clarifying sterilizers and are designed to kill algae, but won’t do much to protect your fish from disease-causing bacteria and viruses. Level 1 UV sterilizers are significantly more powerful and are designed to kill most bacteria and most viruses. Most aquarium UV sterilizers are Level 1 sterilizers since they work relatively effectively and run at high flow rates to clean your entire tank quickly. Level 2 UV sterilizers are the most powerful home-application UV sterilizers available. These sterilizers typically work at lower flow rates than Level 1 sterilizers and have more concentrated UV light to remove difficult-to-kill viruses as well as multicellular parasites that could infect your fish. UV sterilizers are available in different sizes, which typically reflect the power of their UV bulb and their water flow rates. The combination of UV wattage and flow rate determine how effective the sterilization will be and how quickly all of the water in the tank will be turned over through the sterilizer. Ideally, your sterilizer should be able to turn over your tank once to twice per hour. As an example of how to calculate the size you need, multiply the wattage of your UV sterilizer by its effective flow rate and then divide by 1.5 – the number of tank turnovers per hour. If you have a 15-watt sterilizer that works effectively at 30 gallons per hour, then 15*30 = 450/1.5 = 300 gallons as the maximum tank size that this UV sterilizer will work for. The dwell time, or the time that water is exposed to the UV light inside the sterilizer chamber, is primarily related to the water flow rate. The slower the water is flowing, the longer the dwell time. However, different UV lights have different lengths of light tubes, which can change this equation. For example, in the case of two sterilizers with the same wattage and flow rates, if one sterilizer has a 5-inch light and the other has an 8-inch light, water going past the 8-inch light will be exposed to UV for longer and thus sterilized more effectively. The flow rate is closely related to the exposure time of water to the UV light source and is important for determining the size of UV light that you need based on the size of your aquarium. In general, a higher water flow rate will allow you to turn over the water in your tank more quickly, allowing you to sterilize a larger tank, but will reduce the exposure time so that you need a more powerful UV light. Many manufacturers overstate the maximum flow rates of their pumps, so you can double-check the true flow rate by measuring how much water comes through the outlet of the sterilizer into a bucket over a set period of time. UV transmittance is a measure of how well UV light is transmitted through your aquarium’s water. Transmittance is measured on a scale from 0-100%, with 100% meaning there is nothing to get in the way of your UV light and 0% meaning your UV light is not transmitting away from the lamp itself. Transmittance is most affected by the turbidity, or cloudiness, of your tank’s water since UV light will not pass through small particles floating in the water. In general, it is good practice to put a filter in front of your UV sterilizer to ensure that bacteria and viruses are passing in front of the UV light in relatively clean, high transmittance water. If cloudy water and low transmittance remains an issue, you’ll need a higher-wattage UV light with a longer dwell time. UV lamps may use mercury at either low or medium pressures to generate their light. Low pressure lamps typically have higher performance and are used in most aquarium UV sterilizers. However, low pressure UV lamps are sensitive to temperature fluctuations and typically work best above 20°C (68°F). If you have a cold-water aquarium, you will need to dramatically decrease the water flow rate, opt for a higher wattage light, or choose a medium pressure lamp. The body diameter impacts the dwell time of the water and represents a choice between high flow rates and thorough treatment. A higher diameter sterilizer will allow water to be in the UV chamber for longer since you can turn down the flow rate and still keep the turnover time the same compared to a narrower sterilizer. However, as the diameter increases, the chances that the water furthest from the UV light source is not being sterilized increases. On the other hand, a sterilizer that is too narrow will sterilize all of the water but will waste UV light, increasing your tank turnover time and your electric bill. Typically, UV sterilizers between 3-inches and 5-inches in size represent a good compromise between flow rate and treatment quality. Will it Fit between Water Inlet and Outlet Ports? UV sterilizers come in a variety of lengths, which matters since you will want your sterilizer to fit between the existing water inlet and outlet ports in your tank’s filtration system. You can find the maximum length of UV sterilizer you can use by measuring the distance between these ports – if your sterilizer is too short, you can always add tubing to reach the ports. Does it Use a Quartz Sleeve? Quartz sleeves can be put around the UV light to increase the temperature of the light, which is important for low-pressure UV lights that operate more effectively at high temperatures. Quartz is used in this case because it has nearly 100% UV transmittance. However, quartz sleeves are not necessarily beneficial if your tank is already warm enough for a low-pressure UV light. They are more difficult to keep clean than the light itself, which reduces transmittance, and doesn’t allow direct contact between the UV light and the water to be sterilized. 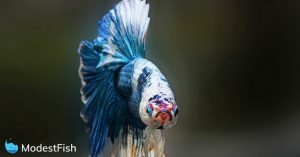 What are You Trying to Get Rid of in Your Tank? The type of UV light that you need ultimately comes down to what you are trying to get rid of in your tank. Nearly all UV lights, including clarifying UV sterilizers, will take care of easy-to-kill bacteria and viruses. However, if disease outbreaks are a consistent problem in your tank, you’ll need to upgrade to a Level 1 or Level 2 UV sterilizer to deal with stubborn viruses. Parasites are the most difficult pathogen to kill and require Level 2 UV sterilizers with prolonged dwell times. Importantly, instead of changing your light’s power, you can change the water flow rate to increase the dwell time and install a filter to increase transmittance. Both of these steps can be used during a disease outbreak to keep the tank water as sterile as possible and prevent disease-causing microbes from spreading rampant. Now that you have a clear understanding of how to choose, you can use the product reviews below to make an informed decision. This UV sterilizer from Emperor Aquatics features one of the most powerful UV lights found among aquarium sterilizers at 25 watts. That makes this sterilizer ideal for large aquariums – it is rated for tanks up to 125 gallons – since you can run at relatively high flow rates while still achieving effective sterilization. In fact, the sterilizer is effective at removing disease-causing bacteria even at rates up to 200 gallons per hour. The three-inch body is relatively narrow given the high wattage of the light, so you may waste some electricity, but you can be certain that no water will go untouched by the UV light. The sterilizer also comes with a quartz sleeve, which makes it a good choice for cold water tanks where the UV light needs insulation to work efficiently. Note that this sterilizer has a 1.5-inch distance between the inlet and outlet ports. The UV bulb itself is rated for up to a 9,000-hour lifespan, which corresponds to about one year of around-the-clock use. The heavy plastic casing is watertight and corrosion resistant and is designed to last for years of use. 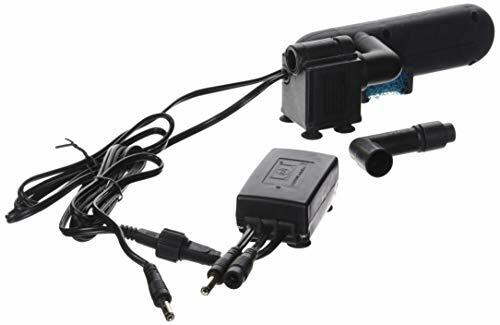 This inexpensive and compact 9-watt UV sterilizer from AA Aquarium is perfect for keeping small aquarium tanks clean. The sterilizer is recommended for tanks up to 50 gallons in volume and is rated for flow rates up to 60 gallons per hour. Flow in the UV chamber occurs in a zig-zag to increase the dwelling time without reducing the flow rate. The sterilizer is unique in that it uses a sealed UV bulb, which is designed to make changing the bulb out as simple as possible. There are no gloves required to change the bulb since you never actually touch the bulb itself. In addition, the UV sterilizer comes with an LED on the control box that tells you when it is time to change out the bulb. The unit is designed to hang inside your tank rather than connect in-line in your aquarium system, which makes setup a cinch. The sterilizer comes pre-assembled so that getting it running takes only a few minutes. In addition, the pump comes with a three-year warranty to protect your purchase. 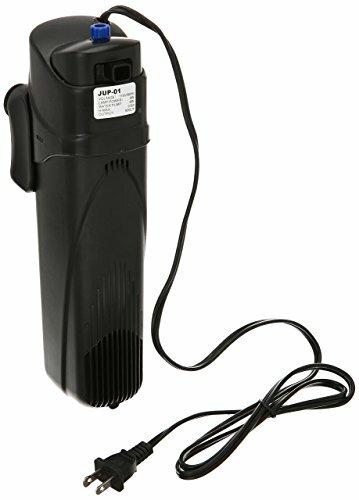 This 9-watt sterilizer from SunSun is a good choice for moderately large tanks and is recommended to aquariums up to 75 gallons in size. Like the AA Aquarium Green Killing Machine, the UV sterilizer has a built-in pump and is designed to hang inside your tank rather than connect in-line to your water flow system. The sterilizer is quite large and produces a lot of suction, which can be problematic for reef tanks with fish that are accustomed to living in calm waters. The 210-gallon per hour flow rate is in particular too high for tanks that are much smaller than 75 gallons. However, the sterilization is extremely effective thanks to the relatively large length and diameter of the chamber. The sterilizer is simple to install and can be hung vertically or horizontally depending on the setup of your tank. This powerful sterilizer from AquaUltraviolet is perfect for moderate-sized tanks where an in-line UV sterilizer is preferred over a hanging sterilizer. This sterilizer is designed to support flow rates up to 240 gallons per hour or slower and you can use your tank’s pump system to control the flow rate and dwell time for more complete sterilization. The sterilizer is recommended for tanks up to approximately 75 gallons. 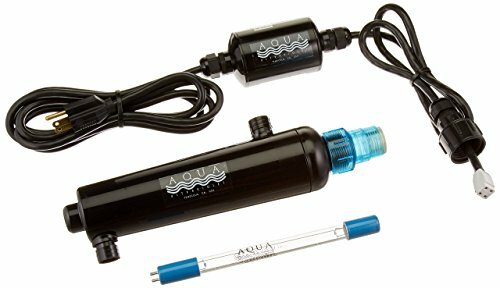 The unit is compact and lightweight with a three-inch diameter to ensure that all of the water in the chamber is hit effectively with UV light. The exterior tubing is constructed from heavy-duty PVC plastic to ensure that it is durable. Installing the sterilizer into your water flow system is extremely easy thanks to the barb-style input and output, although it is worth noting that the unit does not come with a mounting bracket or tubing. This 8-watt UV sterilizer from AquaUltraviolet is essentially a smaller version of the Advantage 2000+ 15-watt sterilizer and has many of the same excellent design features. The unit is designed to install in-line so that the flow rate can be controlled by your main tank pump or an auxiliary pump. Given the sterilizer’s small size, it is recommended for tanks of 50 gallons or less. The sterilizer is designed from heavy-duty PVC plastic to ensure that it remains watertight over the entire lifespan of your aquarium. The best UV sterilizer for your aquarium depends on the size of your tank and the disease-causing organisms you are trying to eliminate. When trying to get rid of difficult-to-kill viruses and multicellular parasites like protozoa, we recommend the Emperor Aquatics UV sterilizer. This sterilizer boasts a powerful 25-watt UV lamp encased in a narrow 3-inch body so that any water passing through the chamber feels the full force of the UV light. 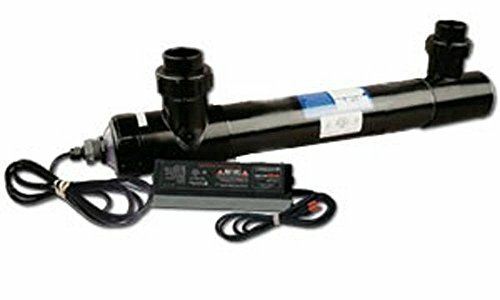 The power of this light also makes it a relatively good choice for large aquariums since it can be run at high flow rates. When an in-tank hanging UV sterilizer is preferred over an in-line sterilizer for convenience and ease of cleaning, we recommend the AA Aquarium Green Killing Machine. This 9-watt sterilizer is recommended for tanks up to 50 gallons in size and increases dwell time by flowing water through the UV chamber in a zig-zag path. The sterilizer also features a unique encased bulb design that makes changing out the bulb each year as simple as possible. Finally, when it comes to finding an in-line UV sterilizer for a moderately-sized tank and elimination of simple bacteria and viruses, we recommend the AquaUltraviolet Advantage 2000+ UV sterilizer. This unit is made from heavy-duty PVC to ensure its durability and is capable of sterilizing water in tanks up to 75-gallons. Best of all, the barb-style inlet and outlet ports make installing the sterilizer and removing it for cleaning easy. 1. How Often Should I Clean My UV Sterilizer? The UV sterilizer must be cleaned frequently in order to keep the transmittance high – any scum building up on the outside of the light will decrease its sterilization efficiency. Cleaning the sterilizer once per month is typically sufficient. In addition, if you have a quartz sleeve on your UV light, that will need to be cleaned every several months to prevent issues with transmittance decreasing over time. 2. How Often Should I Change the UV Bulb? The UV bulb should be changed every six months if you are using it for disease prevention, or once per year if you are using it simply to prevent algal growth. 3. How Long Should I Run My UV Sterilizer for Each Day? 4. Where Should I Place My UV Sterilizer in My Aquarium? – The UV sterilizer must be after the water pump to ensure that there is proper water flow through the UV chamber. – It is good practice to place your UV sterilizer after a filtration system, since clean water will offer a higher transmittance and get the most out of your UV light. – If you have an in-line chiller, your UV sterilizer should be placed either on a separate line or before the chiller. This is because low-pressure UV lights operate much more efficiently at high temperatures. – Placing the UV sterilizer immediately prior to a sump pump will help to slow down the water flow rate, which can increase the effectiveness of your UV light. Just be sure that your tank will be turned over one to two times per hour.